How many hours do you spend in your car each week? In any crisis, an auto emergency kit could save lives or be a "get home" bag in a grid-down situation. It wouldn't even have to be a major disaster. In a country with freeways and belt routes strung from border-to-border and plagued with traffic congestion, it is always possible to be caught in a gridlock, maybe for hours at a time because of an accident or weather conditions. I remember the time we were returning to our home in Colorado Springs from Utah at Christmas time. If you've ever been on I-70 heading towards Denver on a Sunday night in winter, you can guess what happened to us: major gridlock traffic! Since this was the first time we'd ever come this way on a Sunday night, we assumed there must be a really terrible accident up ahead. Wrong! It was just the skiers returning home from the ski resorts where they spent the weekend. we were in a spot where there are no exits to any small town where we might find...ummm...a restroom! Since we were crawling so slowly, we seriously thought about taking turns hopping out of the car, running to the side of the road, finding a thick bush, and, you know, taking care of business. But the thought of all those people watching and knowing exactly what we were doing — nope, not doing that. I'm pretty sure not many people carry an extra full gas can when going on trips, but we probably should — as part of our auto emergency kit. And the bathroom issue — well, an empty pop bottle might work for one of us <grin>. But seriously, what was important to have that day (especially any winter day) in our kit, would obviously be warm clothes, boots, a lightweight wool blanket (for each of us), and probably hand or body warmers. 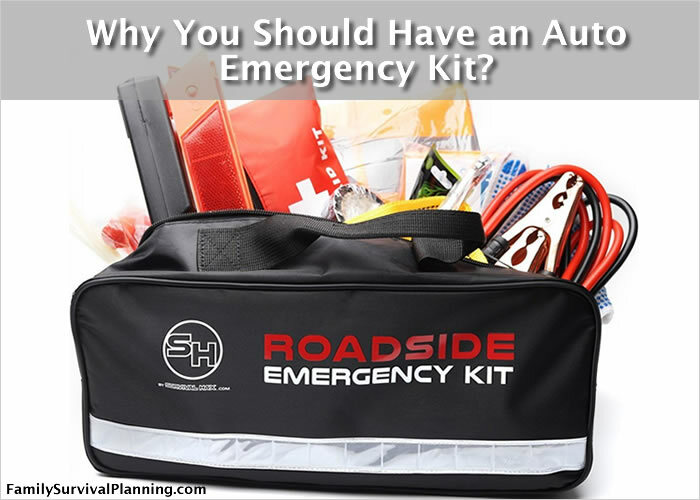 So if you are traveling any distance, especially with children, it is well worth it to put an auto emergency kit in your car with extras for each person, depending on the season and the distance you are traveling. Be sure to pack extra clothing or items for warmth that are weather-dependent for your area or the area you will be traveling to. How many people are in your car most of the time? The answer will determine the contents and the amount of supplies in your car kit. A backpack is the perfect container for most of the extra items. Pack what is necessary so that regardless of the circumstances you will be able to walk away from your car with the supplies that will sustain you if it becomes necessary. But what about situations where you might need to jump start a battery? Or break a window or cut a seat belt to save someone after an accident? Or you might need to tow a stuck vehicle, flag down help, or use basic first aid? Do you have the necessary equipment in your vehicle? We tested the kit (shown above) by taking everything out of the kit and trying out some of the items. We compared the jumper cables with an expensive set we have in our trunk. They are every bit as robust. The flashlight! You will love this flashlight. We have been looking for one just like it and and couldn't find one. It's the type you squeeze the handle (pumping action) and it charges the small battery and keeps the flashlight lit. It was fully charged when it arrived. The multi-tool is really a pocket knife with every conceivable tool neatly folded inside (use it to start a fire with the flint). And the crescent wrench is not a cheap tool either. The first aid kit is small but adequate with a good variety of supplies. You may want to keep a larger first aid kit in your car if you think you may need it when traveling. I consider the reflective safety vest along with the reflective warning triangle an absolute necessity when stopping or stuck on a roadside to change a tire or help someone out. There are so many items that we would have to actually have a crisis to be able to test them all. Everything works and seems to be very high quality and extremely useful. Drinking water in pouches or your own water containers like Hydro Flask. When traveling in your car, consider that is may become your home for a short time or longer. Prepare with that in mind, with your auto emergency kit in your trunk or the back of your SUV, and the extras your family might need in case of severe weather or some disaster happens unexpectedly. Don't forget about supplies or travel blankets for your pets (they come in handy for picnics and sporting events also) as well as age-appropriate items for your children. of Gas at ALL Times. The best thing about auto emergency kits? You always know where they are — in your car.